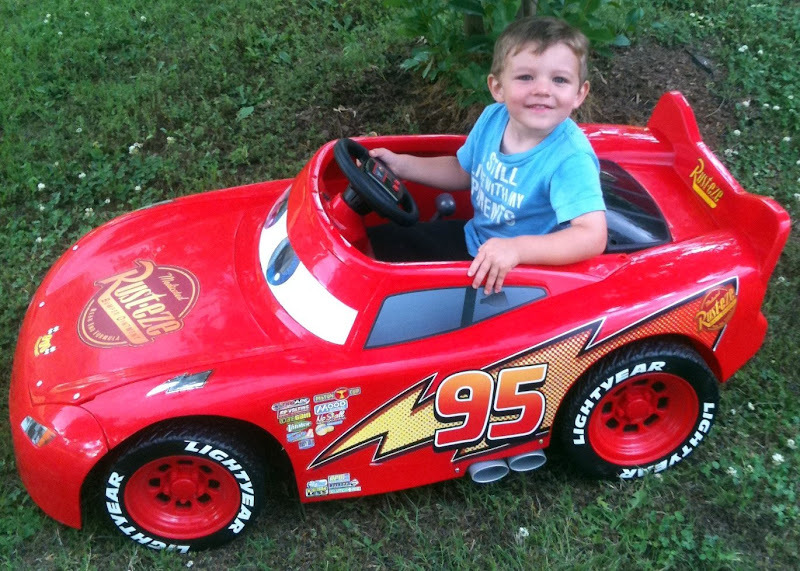 In the last few weeks, I noticed a craigslist ad for a Lightning McQueen Power Wheels. My son's favorite cartoon character is Lightning McQueen from the animated movie "Cars". So, I knew I had to get this for him even though it was $100. Thankfully, I was the first person to reply, it is the 12 volt model, and it is in excellent condition. My son flipped out when he saw it. He calls it his "speed". Almost daily, he asks me if he can drive his "speed" around outside. As far as mods go, I've done only three so far. First, I modified the wiring to allow me to charge the stock 12V 9.5Ah battery using the Schumacher Speed Charge Maintainer that I picked up from Wal-Mart. Second, I improved the turning radius on the Lightning McQueen by removing the restrictor notch on the steering wheel. Now my son is able to take much sharper turns. Third, I upgraded it from 12V to 18V using batteries that I ordered from Gruber. It goes much faster now! I made sure to use an inline fuse holder with a 30A fuse for safety purposes. I didn't replace the stock 14 guage wire. I believe my next project will be fixing up a Dora Lil Quad that I recently got for $10. That one will be for my daughter. I'm keeping my eyes open for more Power Wheels, whether working or not. I'd like to get one for my nephew. I've been checking craigslist and Freecycle. I eBay all the time, but most of the Power Wheels being sold on eBay are out of my area and local pickup only. The information and people on these forums have been very helpful to me. Thanks goes to everyone who has and will contribute to this great site. Hey, post a pict of how the batteries fit. Which ones did you order. Looks like fun. It's kind of funny how you upgrade to 18V for more speed and he ends up actually going slower since it's so fun to do donuts. That's one very nice looking McQueen! I used gseric69's pictures as reference. I'll post pics of mine as soon as I get a chance. I made the cutout for the 6V battery just a tad too large on mine. So, I had to use some epoxy putty to rebuild about 3/16 inch around the top to hold the battery nice and snug. I hope to have time this evening to sand it down to get the 6V battery to fit again. I purchased the 6V 12Ah and 12V 12Ah batteries from gruberpower.com. Gruber sent me a Power-Sonic brand 6V and a Leoch brand 12V instead. Though, they meet the same specifications as the Gruber brand batteries. Haha! Yeah, he loves doing donuts. I've been trying to explain to him that the tires will wear out much faster if that's all he does. I showed him the "boo-boos" on the wheels and told him that the road did it. He didn't seem to care too much. LOL! It's kind of hard to convince a 3 year old to want to drive it on the grass instead of the road. I should record a video of it driving in the grass. It doesn't go as fast in the grass as it does on the road, but it still goes a very fun speed for him. Thank you! I really appreciate the posts you made for your Lighting McQueen. They helped me out a lot! I finally got around to snapping a couple pics of the 18V setup in our 12V Lightning McQueen. Here they are. You may notice around the edges of the left side where the batteries meet the plastic of the vehicle that I used epoxy putty to build up that area to provide a tighter fit. I had accidentally trimmed a little too much using my rotary tool. After I let the epoxy putty set, I painted it red using some acrylic paint from my wife's craft supplies. I think it turned out well and the epoxy putty is holding strong. The sticky looking residue on the top of the blue battery is from some Gorilla Tape that I used to secure that battery in my son's Lil Quad. You got Gorilla Tape off of something? LOL! Yeah, Gorilla Tape is awesome. Thankfully, the tape I used was from a Handy 1" Roll (half width). Otherwise, I may not have been able to remove it. All new post for this project will be made at http://forum.modifiedpowerwheels.com/viewtopic.php?f=19&t=144.